Chris and I have just come back from a very exciting, but tiring, 3 days at the Spring Fair, a Trade show in Birmingham. After 3 days and 16 miles of walking, we have come away with sore feet, aching brains and tonnes of brand, spanking new items for our shops. I thought I would give you a little sneaky peak at some of the fantastic new ranges that will be coming in over the next month or so…. 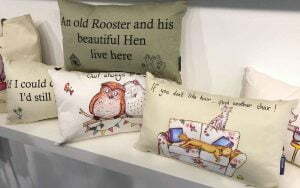 These beautiful cushions are designed by George at Draw UK. We have hand selected some of our favourite designs. These are the ones which bought a smile to our faces, and which we hope will bring a smile to yours. 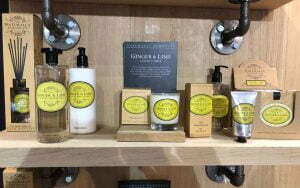 Naturally European are a brand of beautiful soaps, body washes, lotions and hand creams. We have chosen 4 clean and fresh fragrances to showcase in our stores, including the Ginger and Lime, a light Citrus fragrance perfect for both males and females. The attractive, yet understated packaging will make a statement in any home. 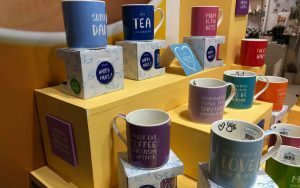 We love quirky at Surrey Homewares, and these mugs fit the bill beautifully. Each mug has a beautiful depth of colour and a funny saying, and inside there is an additional embellishment! Trust me, this is only a very small glimpse of the new products which we have picked, do make sure you pop in to one of our stores, or check out the website regularly to see them! Thats all for now, I think I’ll have a nice cup of tea …….. which mug shall I choose?